Build the Legend with Mega Bloks Dragons Krystal Wars. Size (inches): 12.09" X 2.40" X 7.99"
Enter a world of castles, fearsome warriors, magical crystals and mythical Dragons. Join the epic battles on land and at sea as the Draigar, Norvagen and evil Vorgan armies are locked in endless conflict. This detailed articulated puppet takes you into the heart of the Dragons' universe with light-up eyes and awesome sound effects. 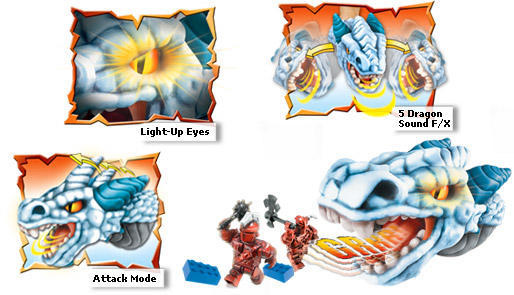 Ice claw comes with fully armed warriors so that you can enter the fray of the mighty Dragon battles. Compatible with other popular building block systems! 7 pieces that are great for little hands! Nothing compares to the quality, durability and all-around fun of Mega Bloks! To be the most dynamic and innovative toy company, building quality products that are expandable and universal. Mega Bloks is one of the top 10 toy brands in North America and is known worldwide for safe, high-quality toys designed to help children learn, discover and have fun. Our building toys are universal, which makes MEGA BLOKS an evergreen brand with enduring popularity.